Sogbety Diomande was born in the village of Toufinga, a small farming community located in the Northwest region of the Ivory Coast near the border of Guinea in Africa. He started his career as a drummer and dancer at a very early age. He has toured with Ballet National de Cote d’Ivoire; been a member of Kotchegna Dance Company, Mask Dance Company, and has been featured with many troupes in NYC and around the US. Sogbety moved to North America permanently in December of 1997 and found his niche in New York City. For the next three years he performed with the Mask Dance Company led by Bley Zagae, the Kotchegna Dance Company led by his uncle Vado, Company Kobake led by Siakka Dosso, the Djoniba Dance Company, and the 7th Principle led by Yaya Kamate, as well as with many other companies and artists. He found himself performing in venues such as S.O.B.’s, Pangia, Symphony Space, Aaron Davis Hall, Lincoln Center, the Plaza Hotel, Museum of Natural History, Brooklyn Academy of Music, and The Kitchen, where he shared the stage with Herbin (Tamango) Van Cayseele, one of the greatest tap artists of today. During the Spring and Summer of 2000 Sogbety was featured as the lead djembe drummer on cult legend Jimmy Buffett’s No Passport Required tour. For most of 2001 Sogbety was a resident artist at Disney World in Orlando, Florida. There he performed at Harambe African Village with Kobake, an impressive Ivoirenne quartet. 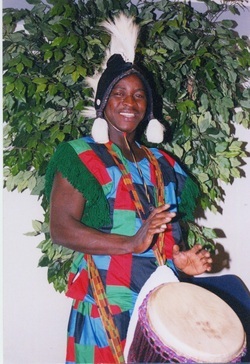 Sogbety started his own troupe in 2005. Sogbety tours occasionally with Jim Donovan's Drum the Ecstatic but spends most of his time in Ohio doing drumming residencies and performances for schools, libraries, correctional facilities and festivals. In 2008 he gathered together a troupe of 10 talented musicians and dancers to headline the Lotus World Music Festival in Bloomington, IN. He started his own festival in 2006 called Sogbety Diomande's West African Celebration where he brings master drummers and dancers together in rural Ohio to teach and perform at his 3-day drum and dance camp.